We're proud to announce our new cookbook! One-pot satisfyingly delicious soups, stews, and chowders so hearty and flavorful you’ll have a complete one-pot dinner on the table in no time. 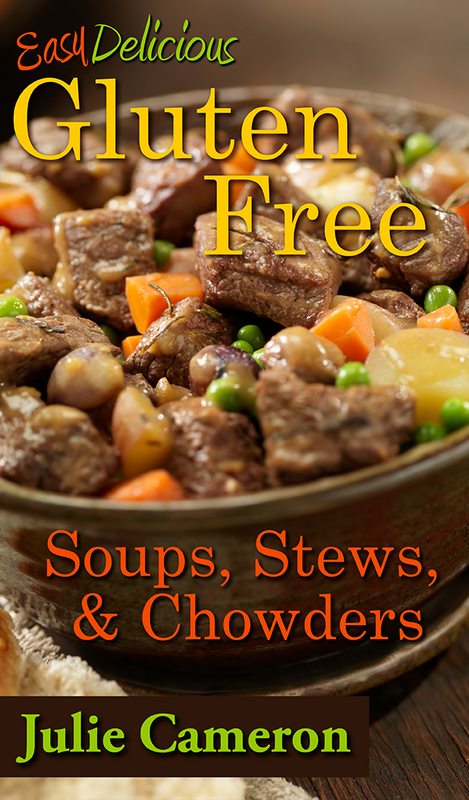 Easy Delicious Gluten-Free Soups, Stews, and Chowders features 50 easy-to-prepare one-pot recipes including Easy Vegetable Beef Soup, Classic Chicken Noodle Soup, Mexican Pork Chili Verde Stew, New England Clam Chowder, Shrimp & Rice Gumbo, Easy Ratatouille, Classic Beef Chili, Summertime Gazpacho, Chicken & Rice Soup, Hearty Minestrone Soup, Herbed Tomato Soup, and many others. This electronic cookbook is value-priced at $3.99 and available on Amazon for convenient download to your Kindle ebook reader. It is also viewable on Apple devices (Mac, iPad, iPhone, iPod Touch), Android or Samsung (phones, tablets), or Windows-equipped PC by using the Kindle Reader App. This cookbook can also be gifted to your gluten-free friends by selecting the "Buy for Others" option on the right hand side of the Amazon order screen. For less than the price of a loaf of gluten-free bread your friend will enjoy this gift for years to come. We hope you enjoy these recipes and that they are helpful to you in regaining and maintaining good health!